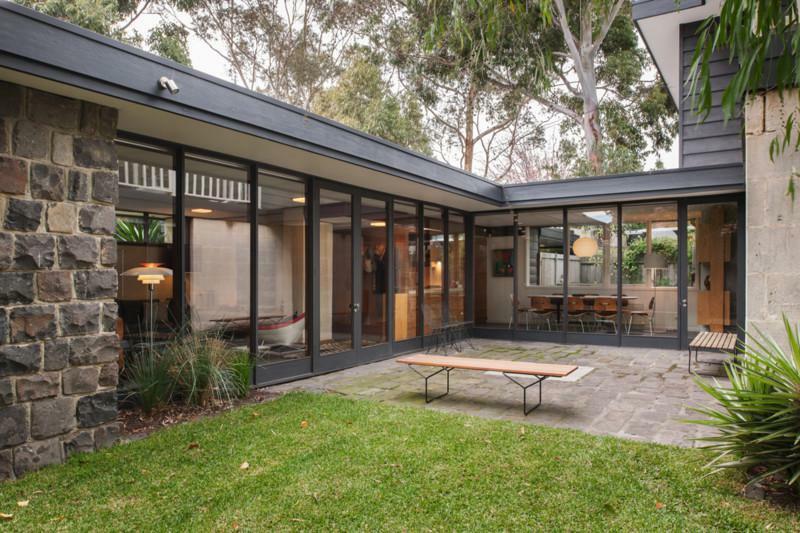 One of my favourite mid-century modern resources is Modernist Australia (www.modernistaustralia.com) and their great list of mid-century modern houses that are up for sale. Included on the list is this house in Clonmore Street, Beaumaris, which is along my dog walking route around this wonderful suburb. 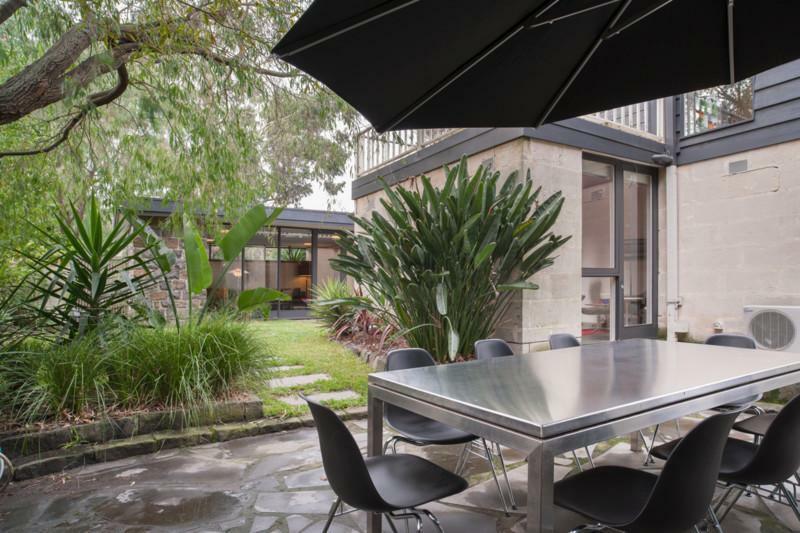 Designed by Linton Reynolds of Woodfull & Reynolds in 1963 (Bayside City Council 2007, p123) this house has been maintained in its original condition both inside and out and is a stunning example of modernist design. 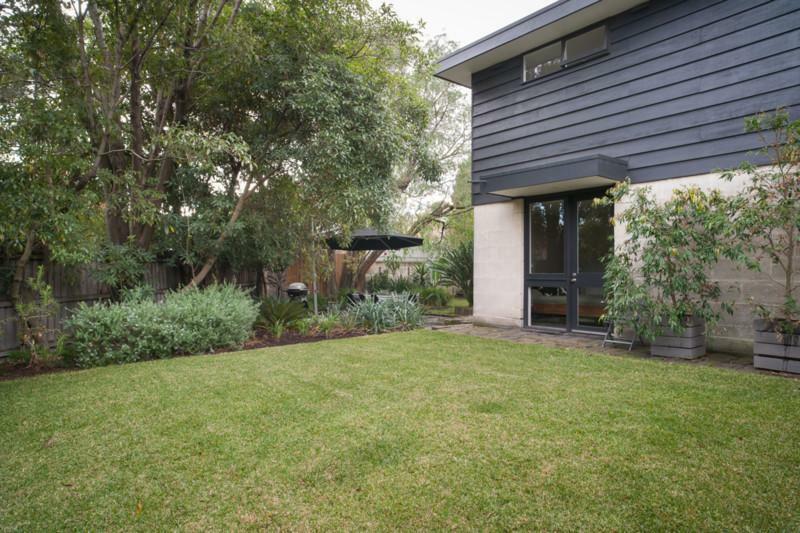 From the street, the house has been landscaped essentially in the Australian bush garden style. 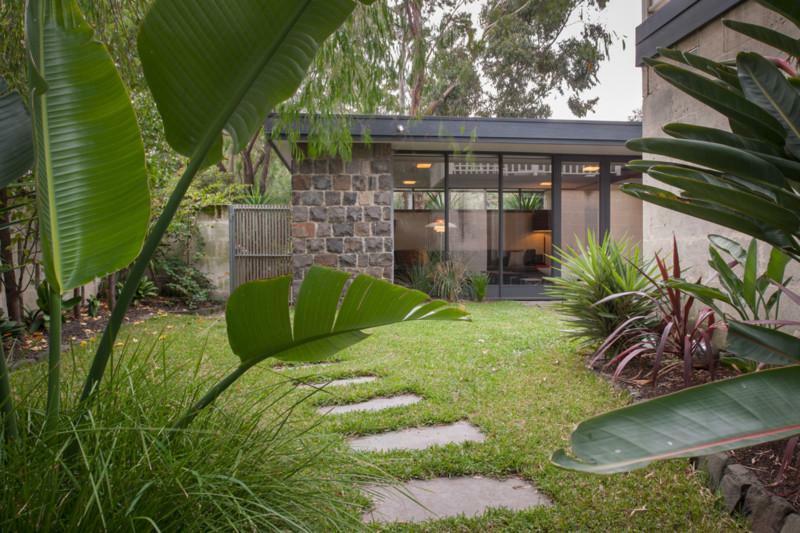 Involving the use of predominantly Australian native plants, this style gained popularity in the late 1950s and was promoted by iconic Australian landscape designers including Edna Walling, Alistair Knox, Ellis Stones and Gordon Ford (Aitken 2010, p201). This style of garden lent itself to complementing modernist architecture and I plan on investigating it in more detail in the near future. The suburb of Beaumaris is characterised by its existing canopy of locally native trees, including Eucalypts, Tea-tree (Leptospermum), Paperbark (Melaleuca) and Banksias. 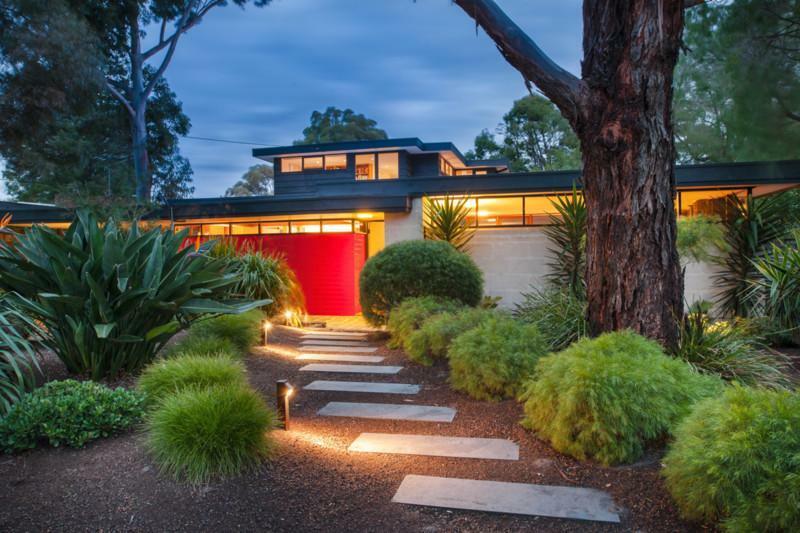 It was the thoughtful approach of architects and designers during the 1950s and 60s that has allowed this environment to be retained and become a sought after place to live. In this same way, the house in Clonmore Street has been designed around the significant native canopy trees. Understorey planting to the front yard consists of predominantly low native shrubs and grasses in mulched garden beds. Large stone slab steppers provide an informal path through the garden to the front door with additional access provided via the driveway and the front porch is paved in bluestone blocks that are repeated as the feature wall of the main living room. A number of external spaces are divided into separate courtyards through the clever use of bluestone edged garden beds and areas of lawn. Living spaces with floor to ceiling windows connect directly to these paved courtyards and again the materials used complement and reflect those of the house. Access is provided around the house with a continuation of the bluestone pavement hard against the external wall and via stone steppers across lawn areas. The garden beds and lawn areas retain clean, simple lines that mirror the geometry of the architecture. The simplicity of this layout allows select pieces of furniture and planting to provide the ornamentation. While the addition of fashionable plants such as Yuccas and New Zealand Flax (Phormium) is not to my personal taste, they do work well in this instance and are not the dominant features as you might see elsewhere. 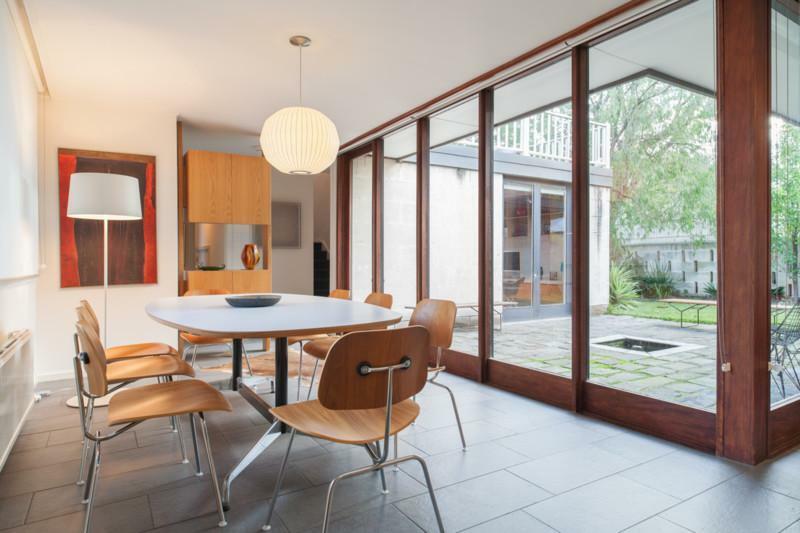 It’s great to see a well maintained example of mid-century design such as this and I can only hope that the next owner will have the same passion for retaining its character! So what can be learnt from this home? The design of the house has allowed the retention of significant canopy trees. Predominantly native plantings in the ‘Bush Garden’ style are an integral component of the overall design. 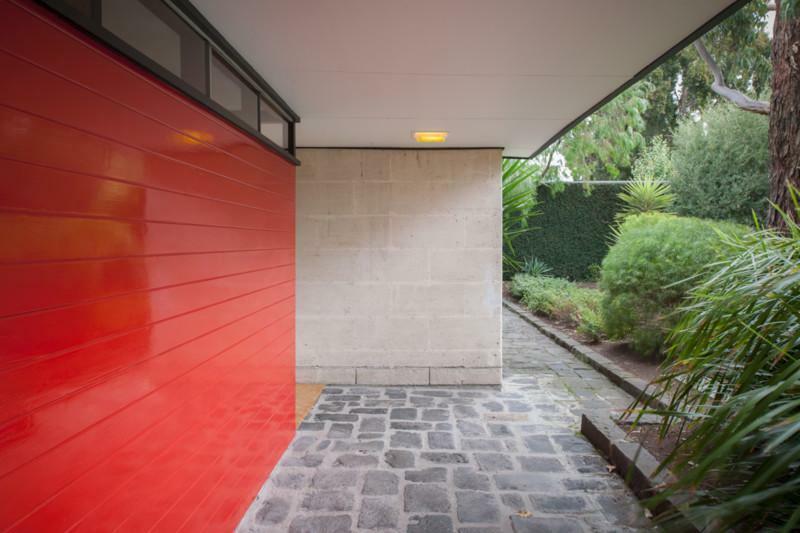 Landscape materials reflect those used inside the house. External courtyards perform as an extension to living rooms. Clean, simple geometry in the landscape design reflects elements of the house and allows ornamentation to be provided by plantings or furniture.